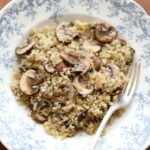 Roasted Garlic Quinoa with Mushrooms is a memorable side dish (or main dish, if you’re like me and it proves irresistible!) This recipe is as simple to make as it sounds. 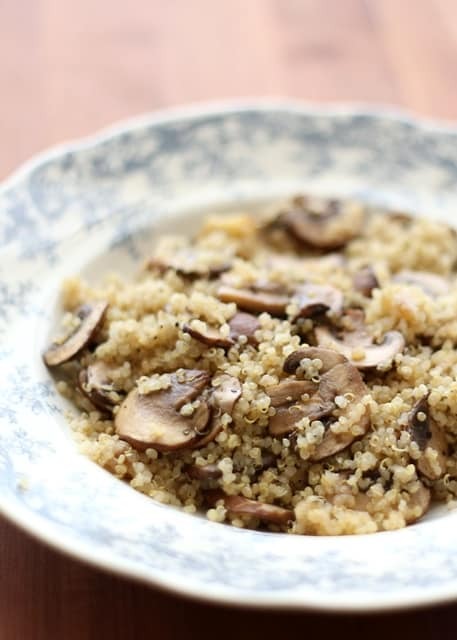 Roasted garlic, sautéed mushrooms, and quinoa are tossed together in a hot skillet to create this incredibly flavorful dish. This is an unassuming recipe that might be overlooked initially, but once you’ve tasted it, it will become a fast favorite. I have some quinoa saved in the refrigerator right now, so that I can make this again later this week! 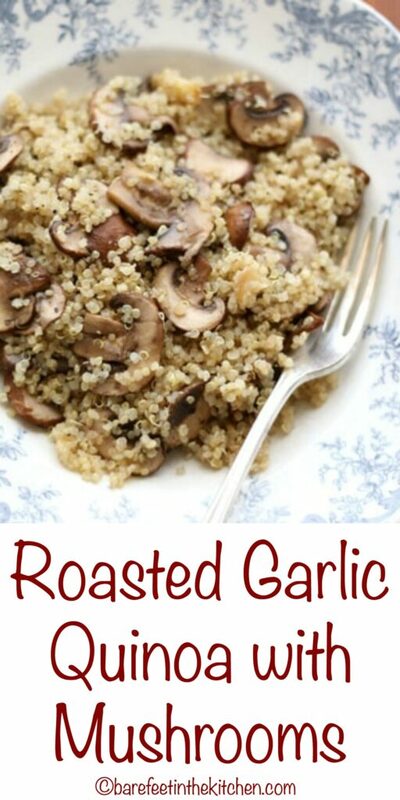 Once you’ve learned how to cook quinoa and how to roast garlic, this recipe just might be a new favorite for you too. I’m telling you, there is something amazing in the combination. And if you happen to be a mushroom lover too? You’re very likely to love this recipe just as much as I do. This dish is one of those recipes that adapts easily to whatever you have on hand. Not a fan of mushrooms? Try it with broccoli. Want to add a little protein? It is fantastic with a soft egg on top. For more ways to use that roasted garlic, try this Roasted Garlic and Bacon Guacamole. (This is the recipe that forever changed my opinion of guacamole.) For another great snack idea, check out these tips for How To Cook Mushrooms and this Mushroom and Roasted Garlic Hummus. Warm the oil in a large skillet over medium high heat. Add the mushrooms, stir to coat and sprinkle with 1/4 teaspoon of salt. Then leave them alone, allowing them to brown before stirring again. When the mushrooms are soft, move them to the edges of the pan and add the roasted garlic. 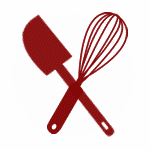 Press the cloves with a wooden spatula to smash and warm them. 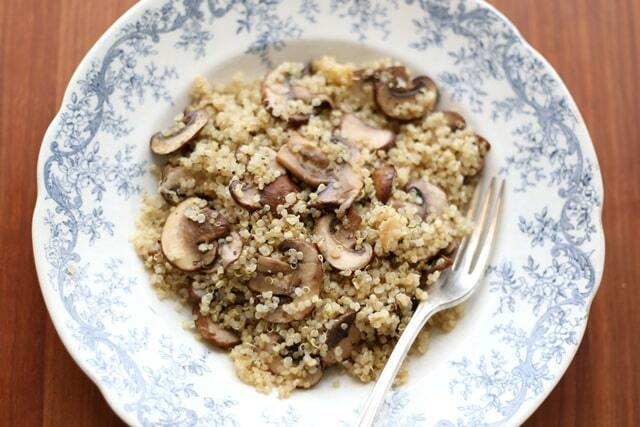 Add the quinoa and toss with the garlic and mushrooms. Add the remaining salt and pepper and adjust to taste. Enjoy! Amazing and good for you recipe. I'm making this for sure. I'd love it if you linked this to What'd You Do This Weekend. Have a wonderful week. Love this idea...anything with mushrooms, Yummy! This was really good! Thank you for sharing! I made this tonight and it was great! I did add a little Balsamic Vinegar towards the end of cooking. So easy! I sauteed the garlic instead of roasting and added some cooked chicken and a little Parmesan cheese at the end. Delicious!!!! This is just the recipe I was looking for. I was craving quinoa and wanted to incorporate mushrooms which I love and happened to have an abundance of at the time. This is literally the perfect side for just about any meal.